Henry is a soap I'm working on for my Father In Law (Henry is his middle name). Dad is in his eighties and when he first tried my soap he commented that his skin improved noticeably within two weeks. He had been previously using Palmolive shave cream out of a tube. I never expected results like that but makes sense when you look at the ingredients of those commercial products compared to the high quality oils that go into hand made soaps. I am not certain whether the scent has transferred effectively to the soap. I'm really happy with the test scent but like other projects, the base oils can significantly influence the scent profile. I knew using Tamanu and Avocado would potentially do this but wanted to try the base/scent combination as Tamanu and Avacado bring some nice qualities to the soap. 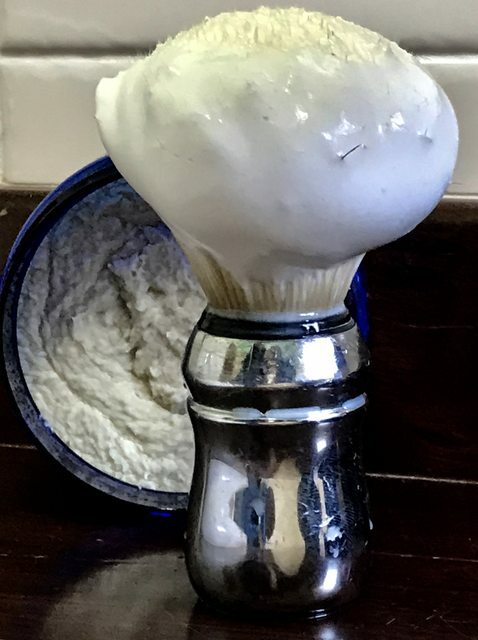 Previously when seeing coffee as part of scent profiles I said to myself I would never use coffee as generally I do not like food associations with shaving soap scents. Recently when making some espresso coffee I noticed some notes of leather/old book coming through which I hadn't noticed previously. I thought maybe a small coffee input may add something interesting and in this case it worked (in the test scent). Coffee is very much in the background and just contributes some nice spicy/leathery undertones. The scent is rich, spicy, with deep cherry, citrus top notes with a rich woody background. The main body of the scent makes me think rich red colour. Will need to spend some time with the soap to think about how it needs to be adjusted to try and bring the scent picture I was after. Test lather was good, but too early to tell how the well the scent is working, though I'm not overly excited yet. Ingredients: Stearic, Olive Oil, Tallow (Beef), Tamanu Oil, Avocado Oil, Coconut Oil, Emu Oil, Castor Oil, Shea Butter, Jojoba Oil, Glycerine, Tussah Silk, Bentonite Clay, Moroccan Rhassoul Clay, Aloe Vera, Water, KOH, NaOH, Essential Oils. Essential Oils: Lemon, Frankincense, Benzoin, Pimento Berry, Sandalwood, Clove, Coffee, Rosemary. I love what you've been doing lately. Had you tried B&M: Leviathan? It's what I turn to whenever I crave a coffee hit. I have been looking at that. Wanna swap a sample? LOL. I walked into that. Always happy to trade with you, Brother. Is there anything else I can include as well? I can throw together a list of what I have handy, if it helps. And what a great gesture towards your FIL. Reworked Pb Henry this morning. Wasn't sure if the Tamanu and Avocado oils were affecting the scent and also my Father in Law indicated that he likes the Brazilian Bay Thyme base so I remade Henry with the BBT base except swapped out the Argan oil for Shea butter for the same scent reasons. I also increased scent strength. Ingredients: Stearic Acid, Palm oil, Mango Seed Butter, Coconut Oil, Castor Oil, Shea Butter, Jojoba oil, Glycerine, Tussah Silk, Bentonite Clay, Moroccan Rhassoul Clay, Aloe Vera, Filtered Water (RO), KOH, NaOH, Essential oils. Essential oils: Lemon,Frankincense, Benzoin, Pimento Berry, Sandalwood, Clove, Rosemary + Coffee. 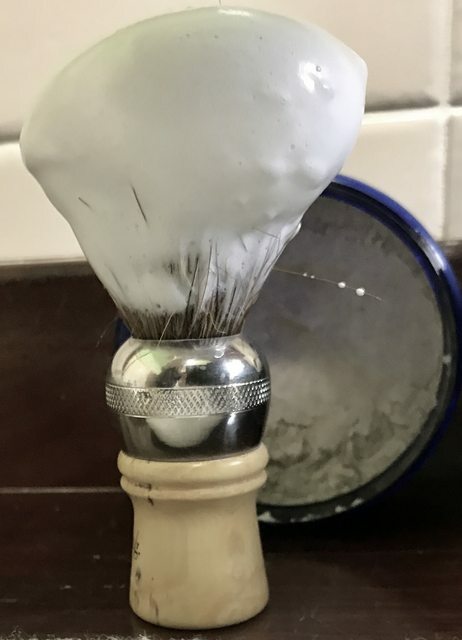 Test shave was very good (passed the Asylum Rx test). Not sure yet whether I'll tweak the scent a bit more but this was really nice within a couple of hours post cook. Cooked Henry Mk III today to try and adjust scent to where I want it. Also adjusted base very slightly (all the same ingredients, just adjusted the quantities). I think I've got the scent to where I want it now (bit less Pimento Berry, bit more coffee). 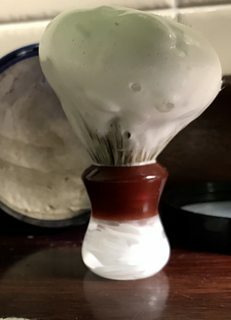 I was very happy with the original test scent but it's taken a few iterations to get it to translate to the shave soap. So that's one tick (the one solitary tick ) on the Christmas shopping list, as this one is going to the Father in Law for Christmas.